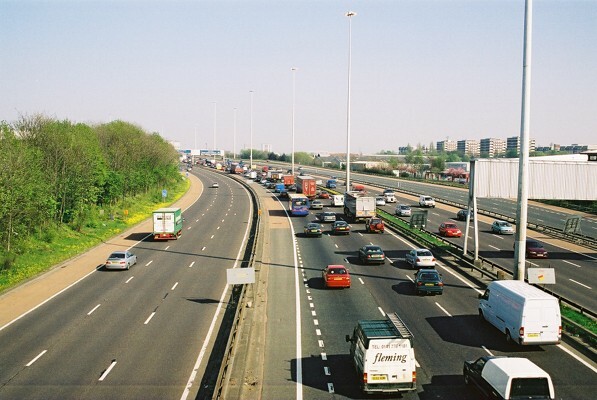 J21 consists of west facing ramps, and J22 is only east facing - so the motorway between them consists of four separate 3-lane carriageways to eliminate weaving. 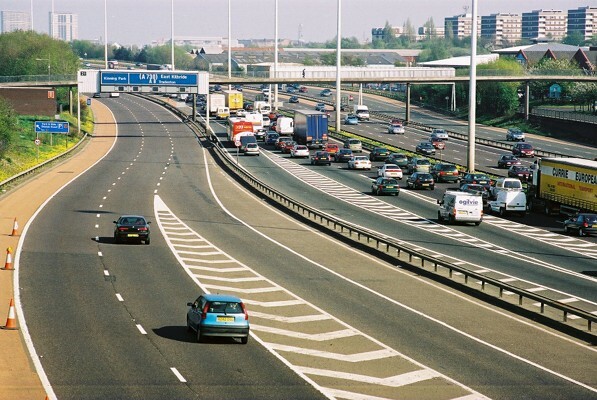 J22 is the more impressive of the two junctions, with left hand exits from the two westbound carriageways and merges from left and from right of the two eastbound carriageways. J21 consists of simple nearside ramps to the street. 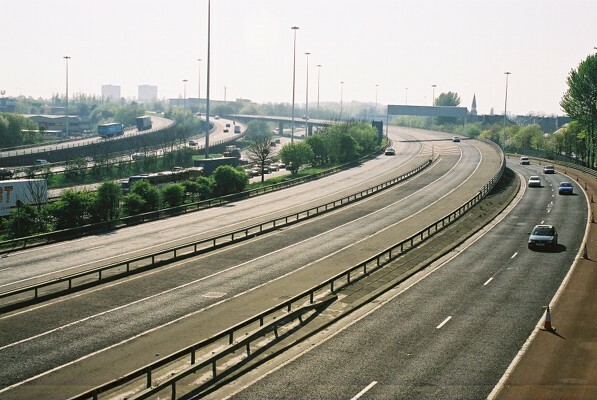 The outer carriageways, which currently serve only the J21 entry and exit, were built to link directly to the south flank of the Inner Ring Road. They're now planned be used for the M74 extension - and this description is written on the assumption that that scheme will proceed. 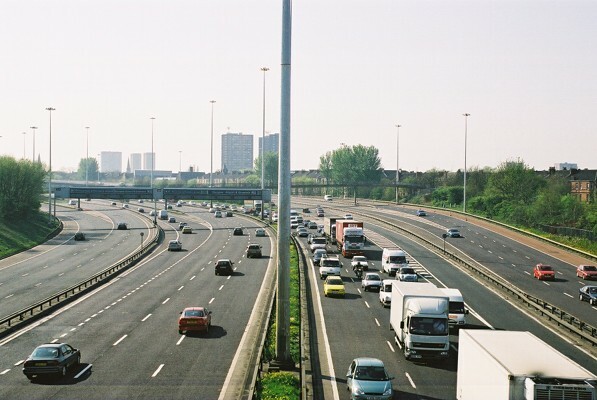 Between J20 and J22, the M8 has four carriageways, the inner carriageways from the Kingston Bridge and the outer carriageways from the M74 and local traffic. 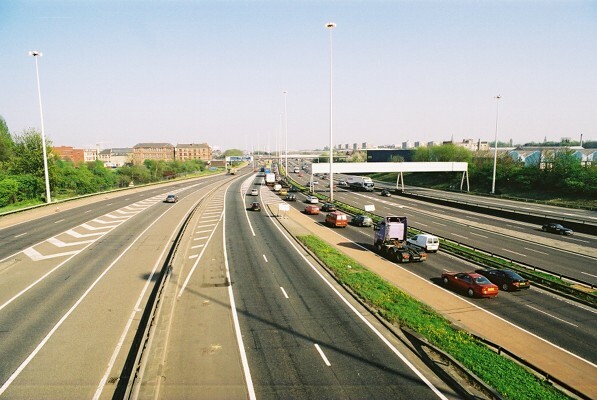 At J22, the M8 and M77 divide, and the junction allows eight flows - four westbound and four eastbound. 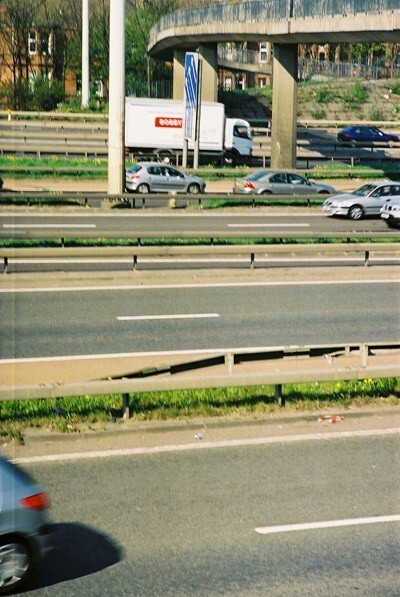 The first of the two J21 exits visible in the distance on the left, and the merge from the matching J21 entry at far right. 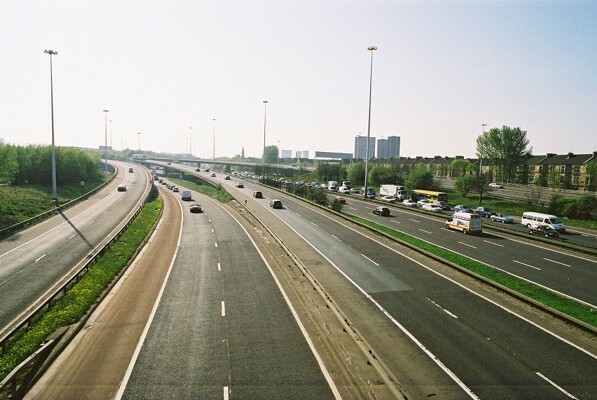 The outer carriageways currently only serves the eastbound J21 exits and the westbound entries, but were intended to form the start of the south flank of the Inner Ring Road, and will become part of the M74. 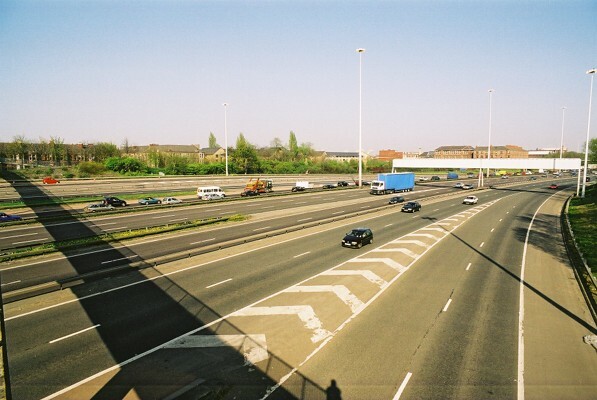 View west towards J22 showing the double exit at left and the two merges at right. 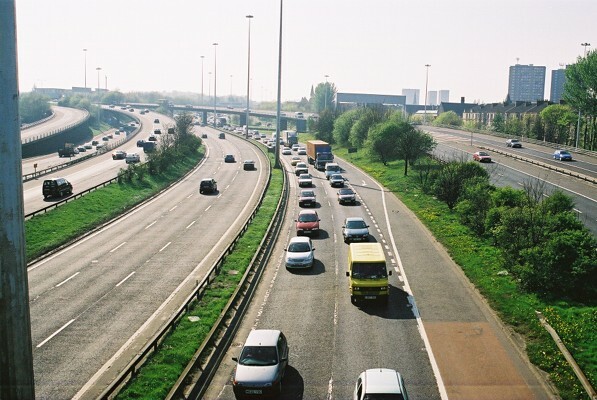 Both the westbound carriageways have a left exit to the M77. 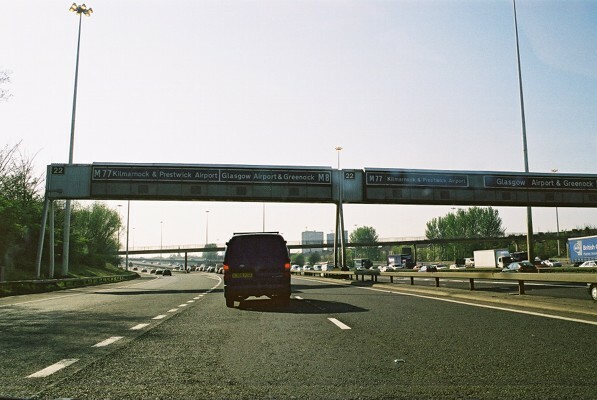 The outer carriageway has a lane drop at the exit, followed by a reduction to a single lane before merging with the inner carriageway. The inner carriageway continues with three lanes throughout. 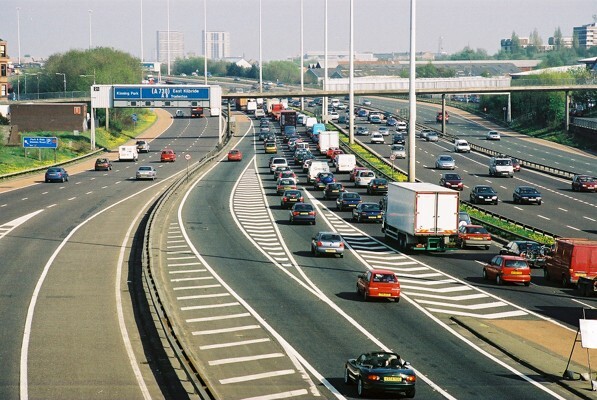 It's expected both through carriageways will be modified to two lanes only, with a tiger-tail merge. 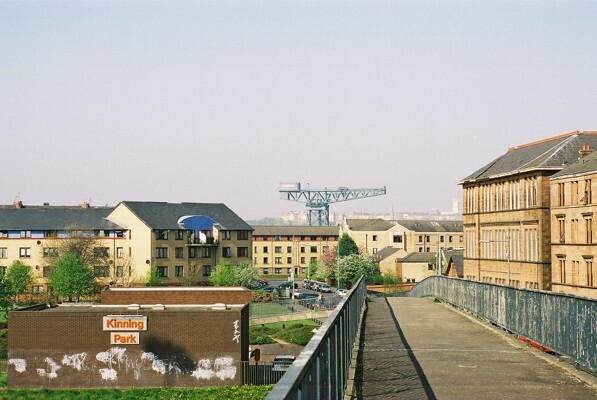 Looking north along the pedestrian overbridge over the junction: The Kinning Park Underground station on the left, and in the distance is the Stobcross crane on the far side of the Clyde. 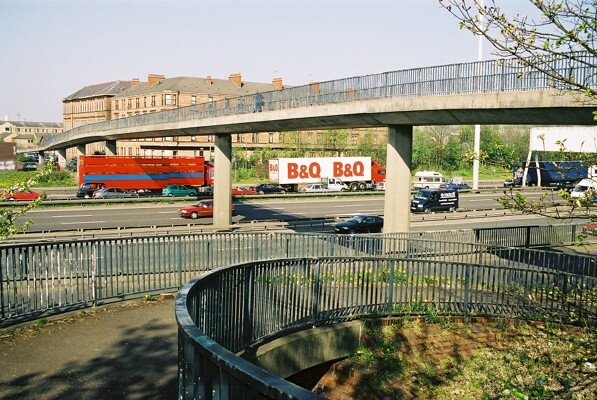 As with parts of the M8 north of the river, the footbridges over the motorway here follow graceful curves and spirals. 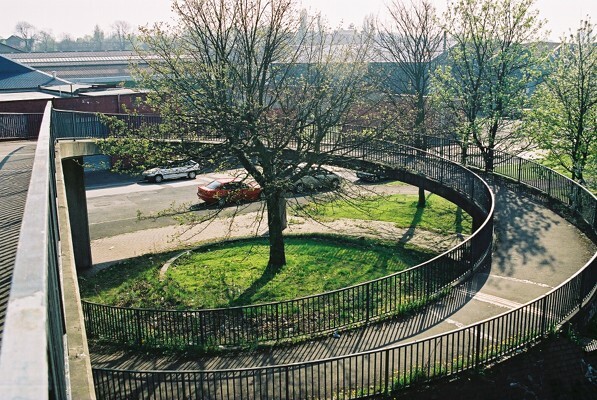 There are no steps on the ramps, so they're fully accessible to cycles and disabled. Vandalism isn't so much of a problem with improved CCTV coverage and a rapid response from local police when problems are detected. 16 lanes of traffic at this point! Looking east from the middle of J22: The other footbridge is visible just beyond the gantry sign in the foreground, with the Kinning Park Underground station to the left. 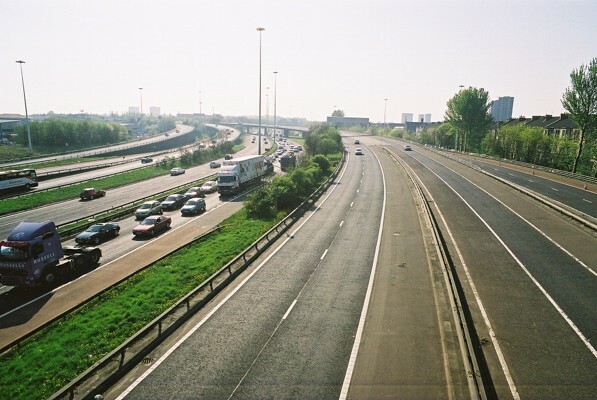 Parallel merges of M77 and M8 traffic. 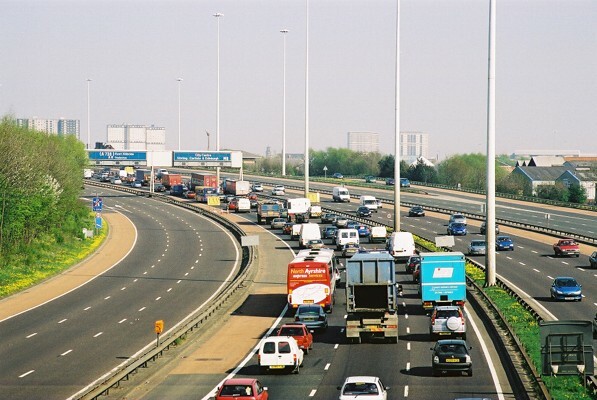 The bulk of the traffic here is currently headed for the Kingston Bridge, but this will change once the M74 Extension is completed and linked to the outer carriageways. Closer look at the M77/M8 merge. 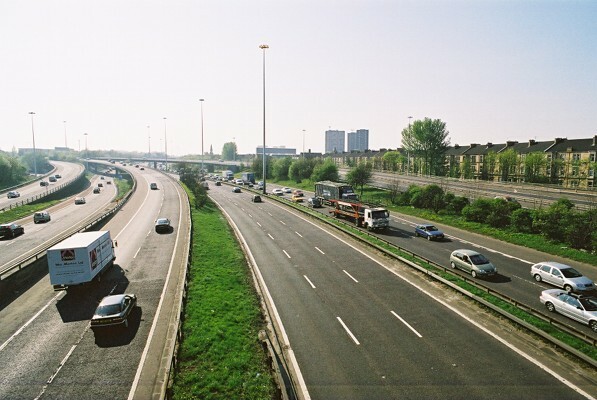 The two lanes at left are from M8, then three lanes from M77, and finally two lanes from M8. 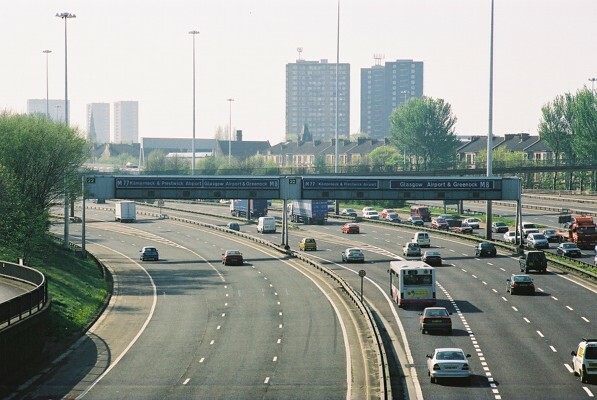 Looking west, the three ramps for the M77 traffic are clearly seen, the two at the left for westbound traffic and the one in the foreground for eastbound traffic splitting into two carriageways to join the M8 traffic rising on either side of it. The lane drop here has been improved by converting it to a tiger-tail merge. Prior to this changethere was a simple lane drop further back on the sliproad, with a single lane at this point joining the M8. The tiger-tail merge allows better balance between the two flows. The eastbound M8 also has a lane drop shortly before the merge - This could easily be improved with a lane drop at the previous exit. This may well happen when the M74 works are completed. 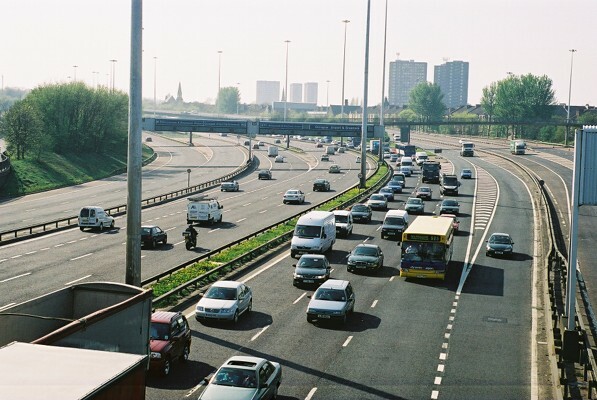 Westbound: M74 climbing to M77, M74 to M8, M8 climbing to M77, and M8 to M8. 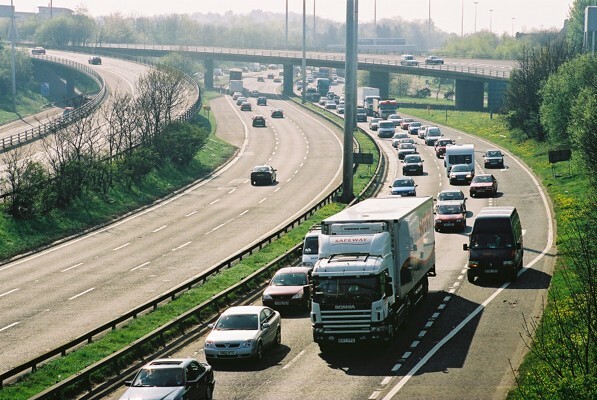 Eastbound: M8 to M8, M77 to M8 and M74 and (out of picture) M8 to M74. View northeast showing the double diverge of M8 and M77. The double diverge seen from the road. 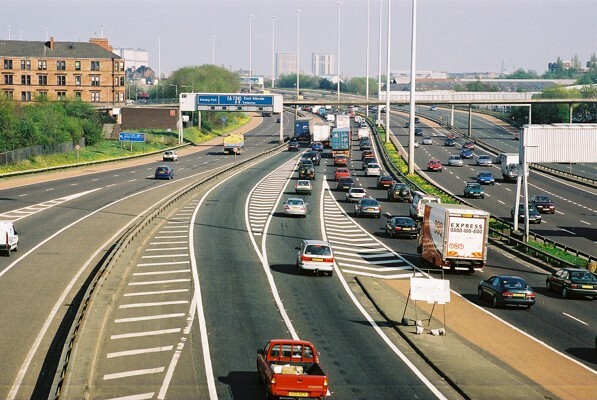 The M77 exits to the left on both carriageways. And one picture of the M8 much further west. 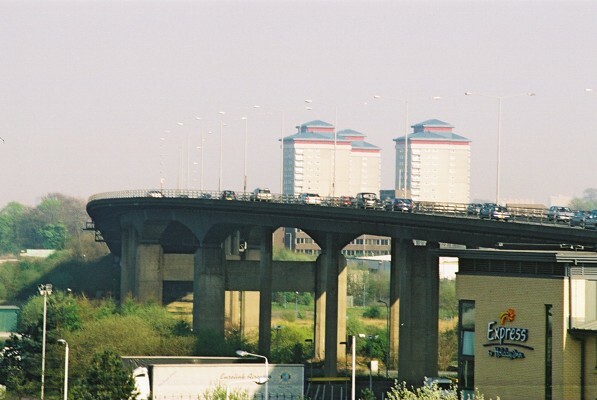 This is the White Cart Viaduct, as seen from the top deck of the new car park at Glasgow Airport.